I woke early this morning and spent time listening to the breeze and watching my last remaining jellyfish do his slow hypnotic ballet. He’s not alone in the tank, he has two unicorn snails with him, and they race around the tank each day – one always counter-clockwise and one always clockwise – adding a swirling time warp aspect to the jellyfish’s swimming. It’s an amazing way to meditate, watching these creatures in the mornings before I fully and truly am awake. When I descended into the parlor with coffee in hand, I discovered the floor covered in ash, dirt and crumbs. Also, a horseshoe. Whilst I ponder the secret life my house is having while I slumber, you can ponder today’s word. Keffel is an old Welsh word that means an inferior and worthless horse; a nag. There are a number of variant spellings: keffel, keffle, and ceffyl. Oh, Welsh. It’s one of my favorite languages, you know? The word is thought to come from the Latin caballus defined as horse, nag. Yes, you are correct, in Classical Latin the word equus is used for horse. Caballus is considered Vulgar Latin for horse. That’s right. I’m teaching you Vulgar Latin as well as Classical Latin in my etymological forays. You are very welcome. Alright. I keep hearing the sound of a farrier’s forge: fire crackling, bellows blowing, steel being hammered. Perhaps this horseshoe is more than just a Word Wednesday prompt. Now I have a question for you: What do you think the term Gee-Gee means? I will not claim that I have fully mapped out the subterranean river that flows beneath my house; I only know that it flows northward since Bubo and I ended up in New Hampshire near Meriden. If we traveled against the current, then, would we end up in Central America? But back to my point; there are underground rivers everywhere! Even in London. Get on your waders! The London Subterranean Waterway Map. How did you fair through Hurricane Irene? Or Tropical Storm Irene. Saturday afternoon, I became distressed – the catacombs are full of history and as-yet-discovered items, and my fear was that the storm surge would cause my subterranean river to seep through the sandbag and rock wall we’d constructed. So I began moving items to higher ground, which took hours. When I pulled a crate of old shaving kits (some relative must have been a traveling salesman) away from near the entrance to the grotto, I discovered an even larger crate, this one filled with Madagascarin Singing Sponges! These sponges are about the size of a regulation American softball, yet they can absorb approximately 5 gallons of water each. When they absorb water, they sing! I carefully stuffed all the sponges into the sandbags, and even made a little pile around the edges of the sandbag wall. Exhausted and anxious, I shuttered the windows and sat in my library, hoping for sleep and waiting for the power to go out. The Vivarium was nearly silent which is incredibly rare, but the birds had huddled into their wings waiting for the storm. Bubo sat vigilant on the back of my reading chair and the flivvervaats were emitting their slight cumin scent – a sure sign that they were petrified. I must have drifted into a sleep, because I woke to singing around 4 am. At first it sounded like a hymn, but then I realized that it was Chains of Love by Erasure. In French AND Malagasy. Based on the fact that the singing wasn’t very loud, I reasoned that not all of the sponges had become wet, and so we were safe. And then it was morning. The Kurundu Bird was singing its rain drop songs, and the flivvervaats were trilling from the cabinets. Bubo was outside in the garden and the air was gentle. The singing from the catacombs/grotto was much louder. Still Chains of Love in both languages. The name Irene comes from the ancient Greek eirene which means peace. I felt no eirene all yesterday, since the Singing Sponges were all fully saturated. I had very little damage at the house. The garden was a bit of a mess but not terribly so. The creatures were all anxious and they made a bit of a mess of the laboratory, even from their cages and cases. But I cannot complain. Now I am exhausted from the preparations and am relieved that the Singing Sponges have dried out and fallen silent. Erasure in French and Malagasy simultaneously must be some sort of torture. Though they did the job, so I will take the slight mental anguish. 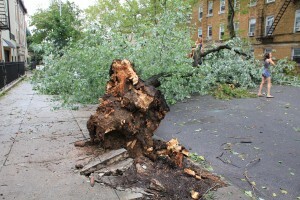 Here comes Hurricane Irene. 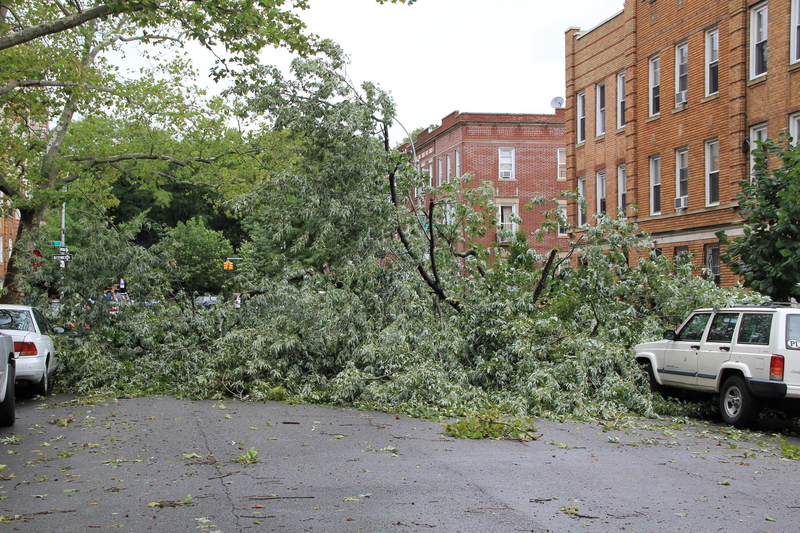 By this morning, we in Brooklyn were already experiencing weather due to the arms of the hurricane – rain and light wind. I spent most of the day yesterday moving things inside from the garden and porches (possible projectiles. a garden gnome is formidable when thrown by 75 mph winds) and boarding up the uppermost windows. Then I remembered the grotto and my secret subterranean canal. A large concern with a hurricane in the mid-Atlantic coastal area is the storm surge and subsequent flooding. This would make my underground river a danger from beneath the house. So I focused my attentions on the grotto. I pulled my tiny barge in from the canal. I boarded up the entrance to the grotto as best I could, with plywood and rocks knocked loose from this Tuesday’s earthquake. I put Mahto to work making sand bags and Beatrix helped me layer and stack them to prevent flooding. The Gruffelnut has a surprisingly keen eye for this sort of thing, and with the help of the specimens, I believe the grotto has been blockade off and we should be safe from a subterranean flood. I hope the catacombs do not flood, but we are on rather high ground here. This old house is not located in a flood zone, and with the proximity to The Green-Wood Cemetery, we’re actually near the highest point in Brooklyn. The dragons and Bubo spent most of yesterday in the wind, watching the storm clouds approach. Poor Barkly, he seems to have gone a bit mad from stress and storm pressure. The Laboratory was a room full of bedlam yesterday, though as the storm steadily approaches, all the creatures seem to have quieted down today. Perhaps anticipation breeds silence? We have battened down the hatches and we are awaiting the storm. Batten Down the Hatches is a nautical phrase, originating in the late 1700s (in William Falconer’s An Universal Dictionary of the Marine). Ship’s hatches (doorways, windows) were often left open for ventilation and air flow into the lower decks of ships. When bad weather approached, these hatches were covered with tarps and other coverings, held in place with strips of wood called “battens”. Thus Batten Down the Hatches literally meant cover the doorways and windows and secure them with the strips of wood. And you thought you wouldn’t learn something today. For shame, oddlings, for shame. Oh, Cousin Octavia. I am often thankful she’s a distant cousin.